Summary: The B15 Exercise Bike from BodyMax will have you do a double-take… It looks every bit as good as a pro spinning style bike, and comes at a fraction of the price. BodyMax produce solid, robust gear. Their experience in weight training equipment comes through (in addition to the design!). Feedback has been very much positive for this model. It is ideal for those who want to move up a level from the flimsy folding type bikes – without breaking the bank to do so. There are some close-up pictures, along with a full spec, over on this dedicated amazon.co.uk product page! You’ll get a big package. This bike is 46.5kgs, really setting it apart from the cheaper ‘V’ style home exercise bikes. Don’t worry, moving it around is easy enough, thanks to some small wheels. Some assembly is required, a commenter mentioned 30 minutes for this. The design is a spinning bike – like those you get in group classes in gyms. Instead of a box at the bottom, the flywheel is visible. This is 20kgs according to BodyMax, though the amazon.co.uk page incorrectly states 13kgs. The frame is angled upwards. Handlebars point forwards, allowing for those all-important sprints. I like the saddle setup for the BodyMax B15. Not only can you control the distance from the front of the machine. You can also tilt it. The saddle is spinning style. If you prefer some extra comfort, there is no reason why you should not get a comfortable gel saddle to go with it. An LED console on the handlebars will track your rides. This is taller than most, and has a simple monochrome display. It is big enough to fit all the key measurements at the same time. You can track speed, distance, calories and RPM. If you have a chest strap, then the computer console can also track your temperature and heart rate. This is an extra, and does not come along with the base unit. You can adjust the resistance with a dial while you are cycling. A nice small touch is the water bottle holder. You do not get this with those flimsy budget bikes. The B15 exercise bike comes with a 1-year warranty for the parts. What Previous Buyers Said About the BodyMax B15 Exercise Bike? It looks like this model can be enjoyed by the whole family! Once comment stated that users from 5 feet 5 through to 6-3” all used this bike. The only real negatives were for a faulty saddle clip (which was replaced) and a mystery ‘clunk’. Otherwise people were very pleased with the performance and the style of this bike. Once buyer mentioned that this was easy to assemble. That is a big plus, as some bikes can be fiddly / difficult. Something that stood out in the comments for me is that the B15 is a step up from the ‘garbage’ cheaper exercise bikes! Wrap Up: Is the B15 Spinning Bike Right for You? This is perfect for people who enjoy home exercise bikes, and are fed up with those rattly budget models (the sub-£100 types in particular). 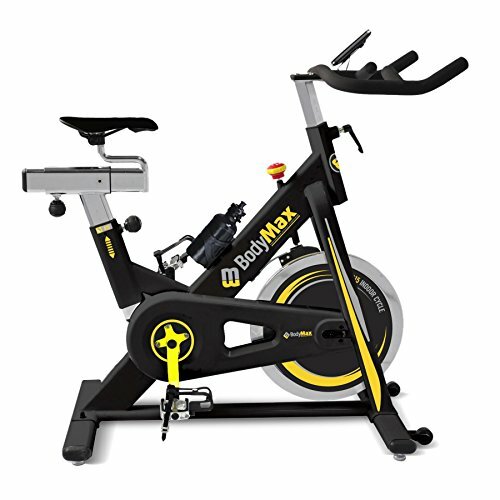 With the BodyMax B15, you’ll get a solid spinning bike which looks great and will give you as solid a workout as you wish. In addition to good looks, you’ll get a fully adjustable frame, 20kg flywheel, bigger screen on the console and even wheels to move it around. Get spinning at home – check out the BodyMax B15 Exercise Bike for yourself now! DKN AM E Bike *not a spinner, though looks amazing!